Fashion this fall is very much a flashback to the 90s. Turtlenecks, oversized chunky sweaters, motorcycle jackets and plaid. Plaid with a vengeance! Blazers, cigarette leg pants, pencils skirts. You can bring it in any way you find it. Nice thing about plaid, it is so classic that it’s an easy trend to find at a thrift store or even the back of your own closet. 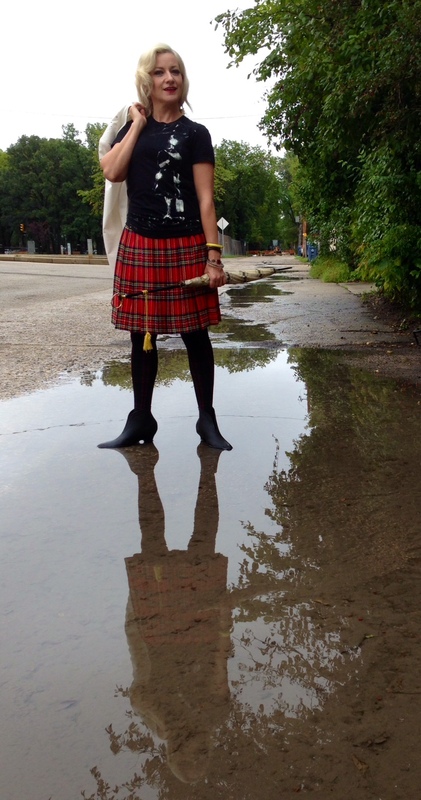 I found this wool skirt (not technically a kilt as it isn’t a wrap around with the flat panel front) on the $2 rack at a recent sidewalk sale at The Closet On River, a Winnipeg consignment store. I love the stiff pleats, the length is perfect and really, you just can’t get more classic than the Royal Stewart Tartan! To me, plaid and boots go together like peanutbutter and jelly. 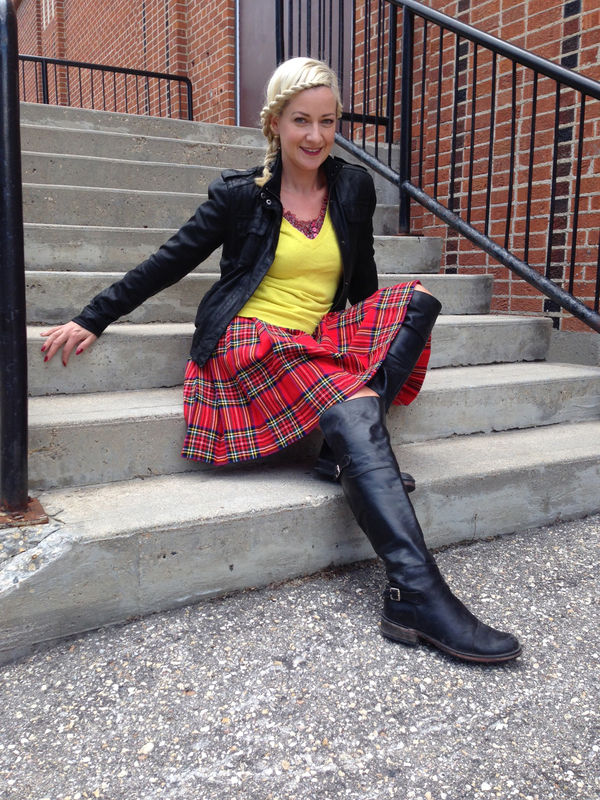 I chose not to pair this skirt with the combat boots I got at Army Surplus when I was 16. (yes, I still have them!) I have certain rules about duplicating a complete look you wore in high school. Just shouldn’t be done! Ankle boots are huge this season, and today is perfect for my vintage, rubber over-booties from Vintage Glory. Or take your boots all the way up over the knee. I wear these Steve Maddens constantly when it gets cold and messy out there! Pretty sure these new Steve Madden boots will be my next pair as these old faithfuls have really been worn to the ground! I love the moto details. This thick wool is quintessentially casual and looks great with a graphic tee like this hand painted shirt by Winnipeg designer, Lennard Taylor. I love my Vero Moda white blazer in the fall. It provides the light layer needed but still feels fresh. Summer is hard to part with, after all! Don’t be afraid to pair some colour with your plaid. Just pull one of the hues from the pattern. Throw in a bit of floral too if you want to have some fun! The little black leather bomber is a safe bet, paired with just about anything, this time of year. Mine was found at Banana Republic on a recent New York Trip. This look is perfect for back to school! Enjoy using this classic fashion staple to add colour into your fall wardrobe. Check out more Thrift Style Thursday posts from these talented bloggers.